Garut is always known for its hotsprings. The location is at the suburb called Cipanas. It means hotsprings in Sunda language (Ci=water or river, panas=hot). Many people believe that taking a bath in hotsprings can cure several skin diseases. Thus, it becomes a favorite family vacation destination. 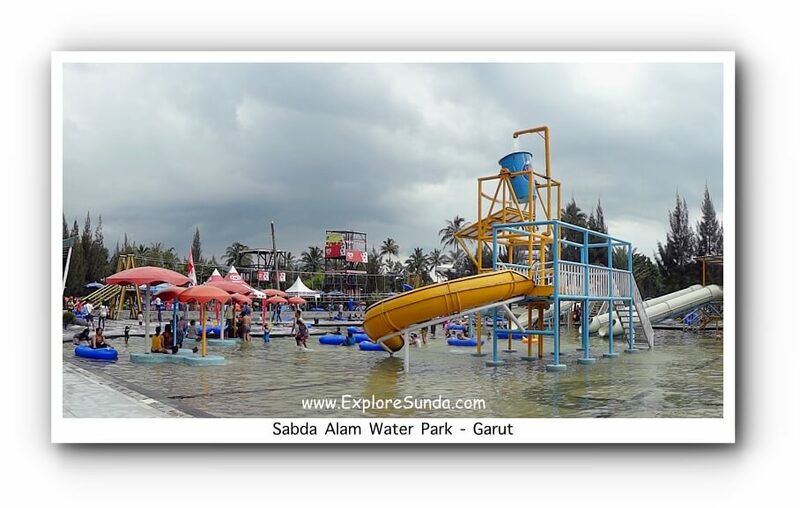 The pioneer of water parks in Garut is Sabda Alam hotel. Unfortunately, when I went there in December 2012 the water park is not well maintained. The water is warm but it is brownish to greenish. Some floors and stairs are slippery. The bathroom is very basic, it only has a pipe flowing hot water. It literally hot, directly from the hotsprings and there is no cold water to mix with. Nevertheless, we have fun there. We walk pass the hanging bridge, watching people slide with tubes. There is a giant bucket that throws water every few minutes. Many people sit under it and count down waiting for the bucket pouring the water over them. There are a couple of fish ponds made of cement under the very high slides. They are filled with Garrarufa fish, also known as the doctor fish. We put in our feet and these fishes bites our dead skin. However, they are larger than the normal size we use in foot spa, so their bites are harder. Overall, this water park has some basic facilities to be called water park, but don't raise your expectation too high. 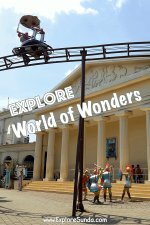 The ticket price is Rp40,000 per person on weekends. It is free if you are the guest of the hotel. The cheaper alternative is to buy tickets to take a hot bath in some bathrooms scattered in this area or swimming in the pioneer swimming pool at the end of the road. 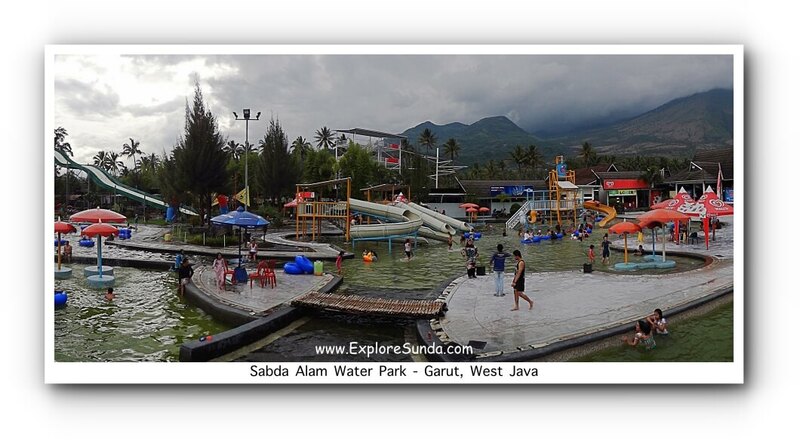 Besides Sabda Alam, other hotels also provide water parks in their yards, such as its neighbor: Dariza Hotel. Other hotels have swimming pool, all filled with hotsprings water. 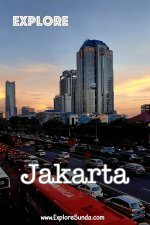 Since it is a small area, we, at ExploreSunda.com, recommend you to shop around first before you decide where to play or spend a night. We even can bargain the room rate during low season. 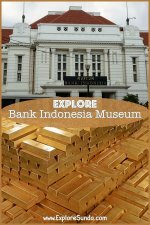 It is relatively easy to go to Cipanas, since it is located just before we enter the town of Garut. Thus, from Bandung we drive through Padaleunyi toll road to Cileunyi, which is the end of the toll road. We supposedly turn right at the traffic light, but since it is blocked, we have to pass it, make a U-turn and then turn left at the same traffic light. There are many textile factories along this road, which makes the traffic congested during the shift changed. Moreover, it is the main road to go from western part of Java to Central Java via southern main road. Hence, although it is only 60 kilometers from Bandung, usually it takes longer than one hour to reach it. We should take right turn at approximately 45 kilometers from Bandung, there are two big traffic signs that show the direction to Garut. Therefore, if you miss the first one, don't panic, just drive a couple hundred meters ahead and you'll see another right turn. Then we only need to follow the road until we see another traffic sign showing the direction to Cipanas. Please note that it is before entering Garut.